Hailed as “two perfect virtuosos” at their international performance début, Kevin and Bryan Matheson of the Classic Strings Duo were received with critical acclaim at their Carnegie Weill Recital Hall début as part of the Ibla Grand Prize competition winners’ tour. The duo has been recognized for its mesmerizing and spirited performances – two perfect virtuosos, playing as one and has performed in Japan, Sicily, Ireland and the Czech Republic. They have teamed up with pianist Brenda Wittwer, a native of Charlotte, NC who now lives in Wytheville, VA. She has been accompanist for Theater Charlotte, Pfeiffer University Concert Choir and Sounds of America, a musical group which toured the 48 contiguous states. With the Wytheville Community College Choir she has performed at Lincoln Center and Carnegie Hall in New York City. 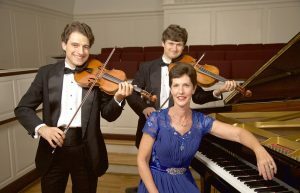 Elizabeth Shelor Matheson is an active free-lance violinist who maintains a private studio at the Floyd Center for the Arts and teaches in communities throughout Southwest Virginia. She has certification with the Suzuki Association of the Americas in violin instruction. Elizabeth is the violin instructor for The Virginia’s Blue Ridge Music Festival’s Blue Ridge Strings Program held at the June Bug Center that provides children with classical Suzuki violin group lessons. Last year she was assistant teacher for the Roanoke Symphony’s Salem after-school strings program. Elizabeth performs with The Roanoke Symphony Orchestra, The Symphony of the Mountains, the Washington & Lee University Orchestra, New River Valley Symphony at Virginia Tech, Valley Chamber Orchestra at Hollins University, Radford University Festival Orchestra and the Wytheville Community College Festival Orchestra and was a finalist at the state level of the James Bland Music Competition. Elizabeth has performed with Maestro David Stewart Wiley, concert pianist Harold Brown, the Saturn String Quartet and the Classic Strings Duo. When she isn’t teaching or performing, you can find her knitting, spinning, playing duets with her husband, Kevin, or hiking and biking with her Blue Heeler dog named Tessa.